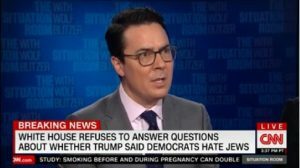 CNN analyst Ryan Lizza said Democrats have a harder time reprimanding elected officials for anti-Semitism because they are a "much more diverse party" than Republicans. Lizza's comments came during a discussion on CNN's Situation Room about President Donald Trump's words following Rep. Ilhan's Omar's (D., Minn.) anti-Semitic comments two weeks ago, as well as the ensuing division in the Democratic party over how to respond. Trump reportedly said that "the Democrats hate Jewish people," according to an Axios report. Lizza said Trump's is "lobbing grenades" into the Democratic camp to try to exploit how "diverse" they are. "This is Trump taking advantage of this, exacerbating the tensions within the Democratic party," Lizza said. "Look, the Democratic party is a much more diverse party. They're always going to have, frankly, more debate, and as the primary goes along here for the president on the Democratic side, this is going to be Trump at every single moment, lobbing grenades—whether it has to do with rhetoric from a House member or policy, he is going to be in there slamming that wedge into the Dems." CNN political commentator David Swerdlick agreed with Lizza's assessment. "In this case, congresswoman Omar's comments gave President Trump the opportunity to make this claim—whether or not there's any truth to it or not—and the President is going to play on that as long as he can," he said. House Democrats passed a resolution last Thursday condemning hatred against many minority groups, sparked by Omar's comments alleging that Jewish people have an "allegiance to a foreign country." House Speaker Nancy Pelosi (D., Calif.) said Omar's words were a result of the freshman congresswoman's "different experience in the use of words." Some Democrats, however, were dissatisfied with a blanket condemnation of hate, wishing that the resolution had specifically targeted anti-Semitism. "This resolution is a fine resolution and I will support it, but I am very disappointed that we weren't able to have a separate resolution to specifically condemn anti-Semitism and what our colleague said that really was a very hateful term," said Rep. Eliot Engel (D., N.Y.), who is Jewish.